This is the first in a multi-part series about how I prepared and trained for my ascent of Shadowboxing in Rifle Colorado. For background on the route and details of my ascent, please read here. The decision to embark on a multi-season redpoint campaign should not be taken lightly. It’s a huge investment in time, energy and motivation. It also comes with a tremendous opportunity cost, meaning the time devoted to a single mega project could otherwise be spent working and sending many other routes, that offer a wider variety of moves and growth experiences. Not to mention the fact that even after a year or more of effort, you might not send! I’d been stuck at 5.14c for a few years, and had been thinking for a while that sooner or later I would need to test myself on the next grade up. I wasn’t in any particular hurry—I was still improving, and so I figured the longer I put it off, the better prepared I would be. That changed in the summer of 2015, when inspiration and circumstances converged to create the right opportunity. The first step in any major escapade is selecting an appropriate objective. 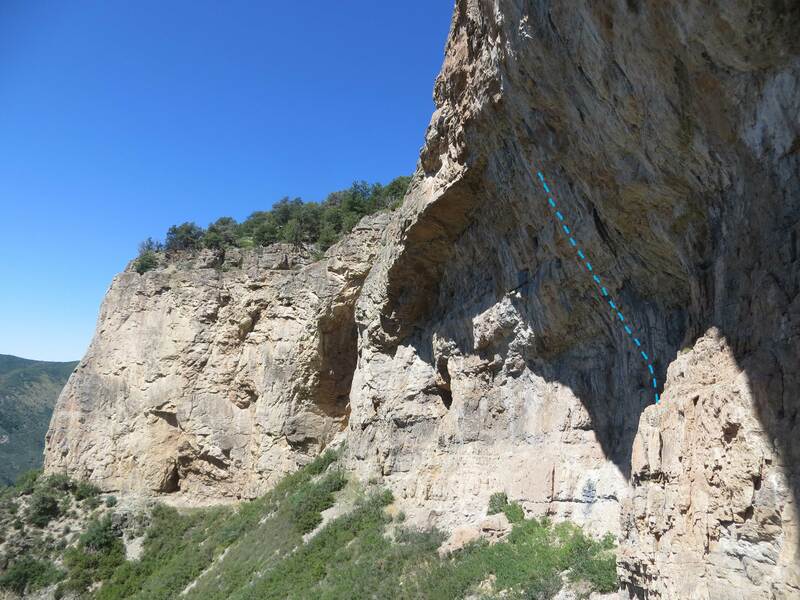 Despite my admonishments to the contrary in the Rock Climber’s Training Manual, the underlying goal was to climb the grade, 5.14d (or 9a in Old Money). Routes of such grade are fairly few and far between in North America, so I didn’t have a ton of options to choose from. Inspiring enough to keep you motivated through several training cycles, even when the end is nowhere in sight. Logistically convenient enough to allow as many opportunities as possible to attempt the route. Factors such as typical weather, length of climbing seasons, approach and geographic proximity all come into play. Non-threatening (from an injury perspective), so you aren’t accumulating injuries throughout the process. I had a few ideas in mind, but there is one guy who knows the American 9a landscape better than anyone else (so much so, that he created a website for it: http://usa9a.blogspot.com/ ). 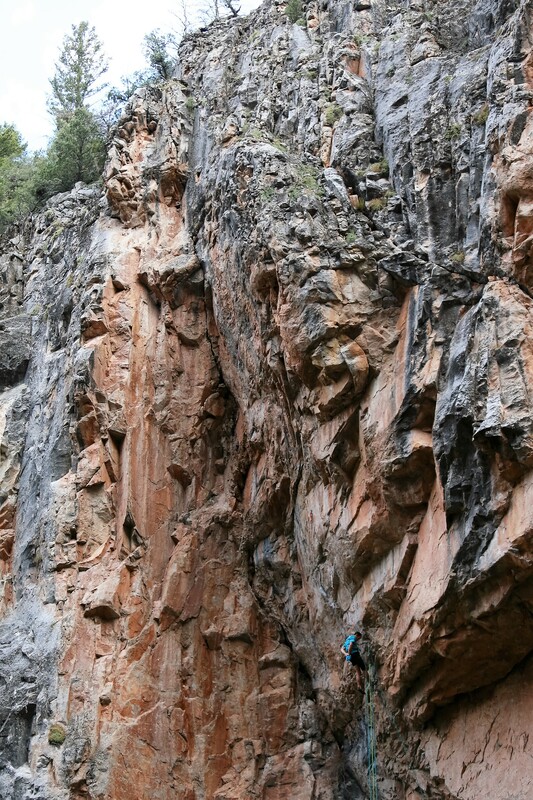 I put my initial thoughts together and asked Jonathan Siegrist for his recommendations, considering where I live, my climbing style, and strengths and weaknesses. 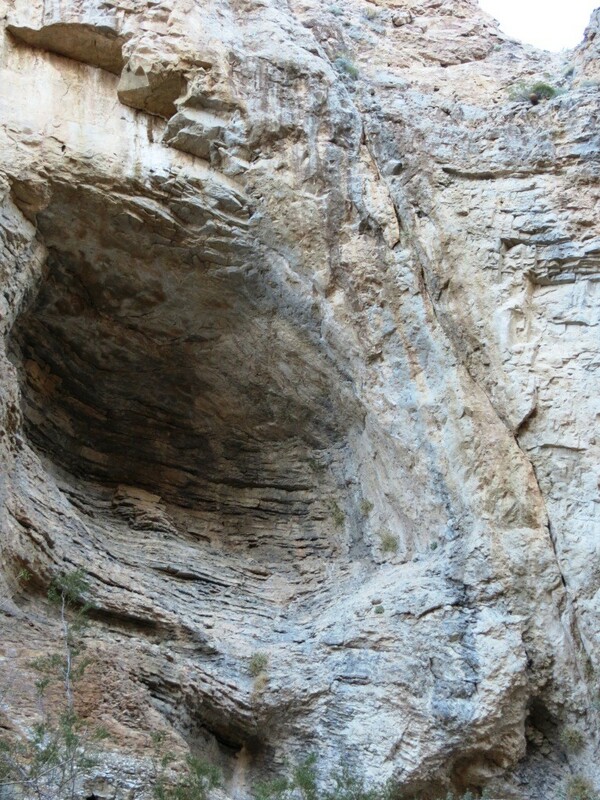 Jonathan’s twin Arrow Canyon masterpieces La Lune and Le Reve climb the right side of the arching cave. Note the sloping belay stance. The primary factor for me was logistics. Jonathan thought the most suitable routes for my style would be one of his lines in Arrow Canyon (Nevada), La Lune or Le Reve. Unfortunately those routes are about a 12-hour drive-plus-approach away, each way, with a belay off a sloping ledge that would be marginal-at-best for my kids. We also discussed Algorithm at the Fins (Idaho), which seemed perfect for my style, but is probably more difficult to reach than Arrow Canyon (and likely hard for the grade). Eventually we narrowed it down to Colorado’s two 9a’s (at the time), Shadowboxing and Kryptonite. 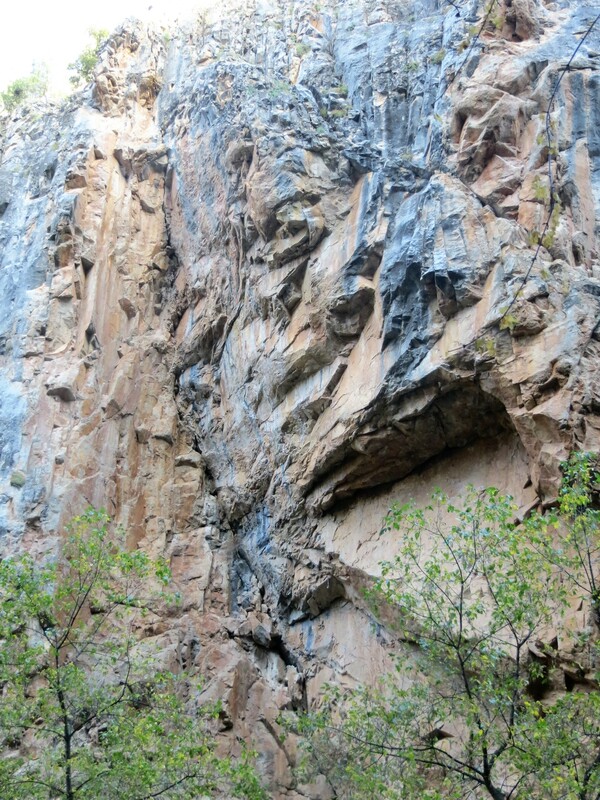 The latter was the first 9a in America, and easily its most popular (based on the number of successful ascents). I’m a huge climbing-history nerd, so it was the obvious choice. It climbs out the center of a massive cave known as The Fortress of Solitude, only about 5 miles (as the crow flies) from Rifle, and similar in style—steep, burly and continuous. The Fortress of Solitude, with Kryptonite roughly marked. On the lower left you can see the top of the steep scree fields that mark the end of the approach. Unfortunately the Fortress sits at the top of one of the most notorious, soul-sucking approaches in Colorado. I made a trip out in late July to see what the approach would be like with kids: nearly impossible without a helicopter. The crux is several hundred yards of loose scree and talus, which you ascend by “Batman-ing” up a series of fixed ropes (while your feet skate in the steep debris). I could probably devise some scheme of shuttling backpacks-stuffed-with-kids to make it work for a few climbing days, but there was no way I could expect to get them up there 10+ times per season. It was equally unlikely to expect I could arrange babysitters, or sucker other partners for the number of trips I would need. That left Shadowboxing…. Based on what I knew of the route, it didn’t seem particularly well-aligned to my climbing strengths, but I figured its proximity to home and ease of access would make up for its sub-optimal style in the long run. I decided I would commit the first four climbing days of my Fall 2015 season to attempting it, and if I felt it was a poor choice at that point, I would retreat and consider other options. Typically my first day on the rock at the beginning of each season is relatively poor, and so it was this time. By the end of my second day I’d gotten good linkage through the easier sections and done all the moves but one, the infamous crimp move. I stuck that move twice on day three, and by day four I had linked the entire route in four sections. I had made a ton of progress during my 4-day litmus test, and so with nothing better to do elsewhere, I decided to continue working the route. The rest of that Fall 2015 season included many ups and downs. One day was entirely consumed working out a single frustrating foot move. At various points I had bleeding splits on the first pads of the index, middle, and ring fingers of my right hand due to one particularly sharp crimp. I acquired a number of nagging aches and pains in my shoulders, biceps, elbows and back from the many thuggish undercling moves low on the route. While I two-hanged the route on my fifth day, that metric never improved over the next eight climbing days. By late October my highpoint was creeping up the route at a rate of about one move per weekend. I could do all the moves consistently, and link long sections with relative ease, but I had hit a wall where my endurance was concerned. As November approached, it seemed like I still had an outside shot of sending that season, but in retrospect I realize that was naïve–I was nowhere close. I needed a whole new level of endurance, not something I was going to acquire on the route over the course of a couple weeks. Eventually weather, illness and previous commitments mercifully converged to provide an obvious stopping point. As we made our way east over the Rockies for the last time of 2015, I was optimistic. I had made great progress and learned a tremendous amount about the route, and my capabilities relative to it. I could to start to see myself as a 9a climber. I would need better upper body strength, and vastly improved endurance to have a puncher’s chance, but now I knew where my weaknesses lay, and I had six long wintery months to attack them. Check back soon for “Training for 9a – Part I”, where I will discuss my winter experimentations with Power Endurance training. Looking forward to the rest of the story Mark. Hope you’re proud of the accomplishment and all the hard work you did to make it happen! As I’m approaching my power-endurance phase for some new year’s eve climbing, I’m really eager to read your next post!